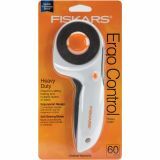 Comfort Grip Rotary Cutter - FISKARS-Comfort Grip Rotary Cutter. 60mm, 6-3/4 long. Lightweight. 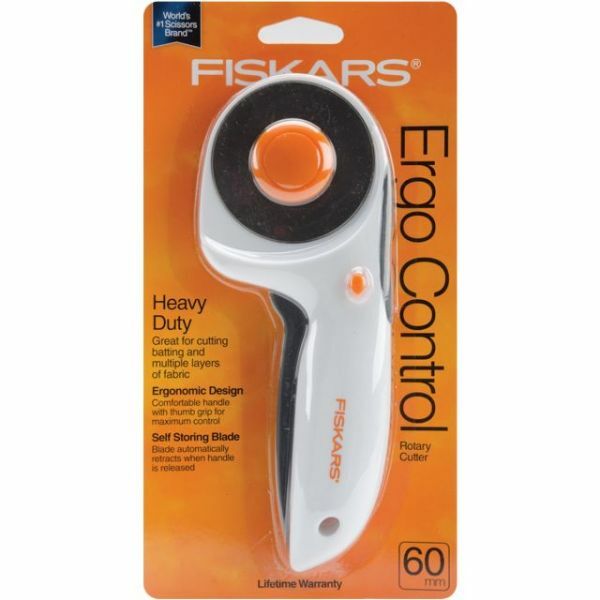 Comfort grip rotary cutter with extra long contour handle and soft grip finger rest works naturally with your hand for ultimate comfort and safety for hours of cutting. Cutter features: Sharp, long-lasting 3-step easy-to-change blade, open blade cove, safety lock and engagement lock, right- or left-handed, easy spring action trigger, hole for hanging, and the improved view of the blade lets you see what you are cutting. Caution: Sharp Blade. Contact may result in injury. Handle with care and keep out of reach of children.